Born in 1732 on the 500 some acres just down the road from my current house, George Washington continued to visit these grounds until 1771. These days it's set up as a working plantation, representative of what a moderately wealthy planter would own during the days when Washington was born. To get there, take Route 3 east and turn left onto Route 204 once you pass Oak Grove. At the entrance to the Birthplace National Monument area, there stands a 1/10th scale replica of the Washington Monument in D.C. There's a traffic circle at the entrance. Keep right and then turn right into the parking lot for the visitor's center. 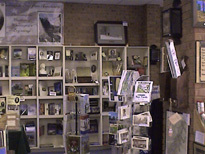 ~ Visitor Center has exhibits, film, bookstore, and restrooms. ~ Ranger talks given on the hour from 10:00 a.m. to 4:00 p.m.
~ Living Colonial Farm featuring heritage livestock and tobacco. ~ Special events offer costumed interpreters and demonstrations. ~ Washington Family Burial Ground. ~ Scenic picnic area with tables, grills, pavilion and restrooms. ~ One mile loop Nature Trail accessed at the picnic area. ~ The Potomac River beach offers view of the river and Maryland, walking, sunbathing, and fishing. Collecting is not permitted. ~ Pet Policy: Pets are not allowed in the Historic Area. In all other parts of the park, please keep your pets on leashes at ALL times while hiking, walking or jogging. Other areas at the site include a picnic area with hiking trail, a public beach and a cemetery area where George Washington's relatives are buried. The entire area is very nicely kept up and I'm so proud to have a facility of this caliber located practically in my neighborhood. The boxwoods on the grounds are from cuttings transplanted there when George was a boy. Tobacco is grown in season and the animals on the grounds are rare breeds of animals which existed in colonial times. 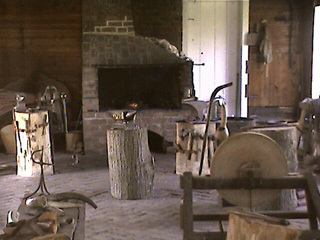 The blacksmith shop is very interesting. Although the house he was born in burned down on Christmas Day in 1779, it was excavated in 1936 and the footings preserved. Today, crushed oyster shells outline the foundation of the house so you can get a feel for it's footprint and size. 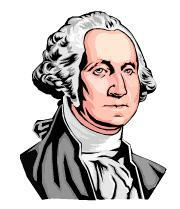 A descendant of his named Josephine Wheelwright Rust founded the George Washington Birthplace Association in 1923. They are a non-profit partner of the National Park Service. The historic area was presented by the Association to the Government on May 14, 1932. George was born here, then grew up in a place called Ferry Farm, which is located 35 minutes back down Route 3 near Fredericksburg. That site saw heavy Union activity during the Civil War in December 1862. The area is open daily from 10 - 5 from March to December and weekends only during the rest of the year. See the Events calendar page for details on the many activities held at the birthplace site during the year.